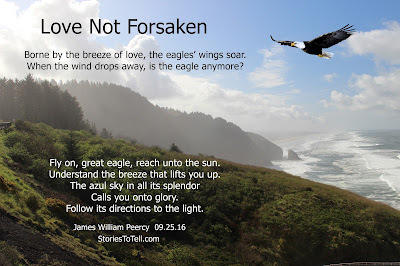 Borne by the breeze of love, the eagles’ wings soar. When the wind drops away, is the eagle anymore? So many definitions fill our heads about love. We have puppy love, no it is not the love of puppies, deep friendship, love for humanity, long standing love, love of self, playful love, and sexual passion. We crave love. We seek love. It is a void filled only by the wants of our desire. In the end, love is dependent upon what we want to feel, not necessarily what is given to us. What is that, you say? Is that even possible? It is our option to love. You cannot be made to love someone, nor can that person be made to love you. You can desire to be with someone, but they may not want to be with you. Does that make a person less than who they are? If the love you give out is not returned, what happens to your perception of self? Sometimes, despair occurs as the soul of the giver shrinks in frustration. Their world seems to crumble. Nothing they do seems right. The dark clouds of self-doubt roll in the sky as the earth quakes beneath their feet. Could this be the end? Will the longing never cease? Other times, we recognize this anguish for what it is. An empty hole we are trying to fill. However, since the love given by others doesn’t meet our expectations, nothing is right. The square block simply does not fit the round hole. We have selected to overlook a most fundamental principle of human relationships. Love is a choice. When we feel that choice is mutual, the entire world glows in brightness. Blue skies on a sandy beach meet our eyes. Lush green forests with succulent fruits are only fingertips away. The starry nights are beyond contemplation. The waves of the ocean dance in delight. Nothing can touch us as we stand against the sway of time. With romantic love, it starts with infatuation. They have blonde hair. They are tall. They are short. They walk so cute. Their name, oh, the name is adorable. Did you see that little dimple on the side of their face? None of these characteristics matter. Oh, they may be the reason we first noticed them. It was the laugh that caught our attention or the smile across their lips. However, to make it go beyond infatuation, it had to become a choice. We, of our own free will, had to choose to love them, and they, of their own free will, had to choose to love us back. The reasons behind the choice are sugarcoating. If I love someone because they are short and they grow taller, do I cease to love them? If their voice is like a beautiful song and it changes, should I drive them away? If they dye their hair a different color, are they still the same person? Love is a choice. We choose to love, or we don’t. It may spring from an emotional state, an infatuation state, a playful state, or a sexual state. However, if you choose not to love, the love is over. In one’s body, certain chemical changes help set the perception of love. When passion is felt for the first time, it is rarely forgotten. If we act upon that passion and it is accepted, fireworks go off. If we use anything but choice as a basis for our love that love can easily wane. Love is good. Love feeds the soul and lifts us. It carries us to places we cannot reach without its boost. It helps us realize who we are. The next time you see someone and you know inside you love them, whatever love that may be, think about it. Contemplate it. See why you have chosen to love. Knowing that may help determine how long it lasts. Fly on, great eagle, reach unto the sun. Understand the breeze that lifts you up. Follow its directions to the light.